It´s september and time to pick our fresh sweet and sour plums from our gardens. Plums are perfect for desserts, home made fool, jam and marmalade. I just love making my own marmalade, jam and fool. If you are able to make with your own plums that’s great otherwise try to find some organically produced ones instead. Fool is a classical English dessert dating back to the 16th century but also a very common dessert dish in Sweden that works equally as well between meals or for breakfast. My grand mother was an incredible cook who would prepare a full year’s stock of fool. Every time we visited her she would give us a whole lot of tasty of fool and jam. This fool is sweet and sour with a fine taste of orange and vanilla. The carrots are hard to disguise , but play an important role bringing together the flavors and adding a bit of extra sweetness. I personally eat it for breakfast with my yoghurt and serve it for dessert with some cream. Cream, as all fat based substance, picks up the aroma wonderfully. This is a recipe you would do a Sunday and eat for a long time after. Bring to a boil. When it boils, reduce to simmer and cook for about 10-15 minutes or until plums starting to loose from its core. Put a side and remove all stones with a spoon. Count them as you remove so you know that you have removed all of them. Add sugar, honey, carrots and scrape seeds from vanilla bean into the plum cream simmer for a few minutes. In a glass, combine corn starch and orange juice, whisk with a fork until corn starch is completely dissolved in water. Gradually pour corn starch mix into the fool, stirring constantly. Bring to boil and let boil for 3-4 minutes, leave to cool before serving. Serve in a bowl and fold into heavy whipped cream or unwhipped as you desire. 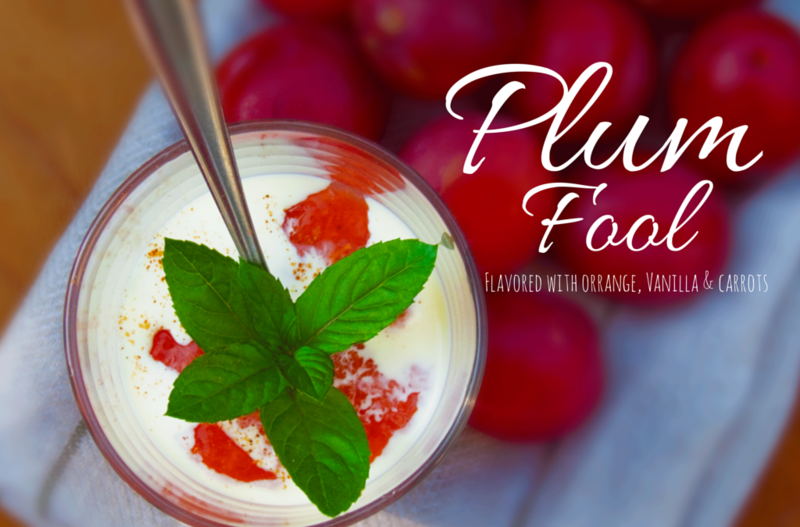 This plum fool is also heavenly with yogurt.